The minute you step out the door, the smile you give to others has the power to make or break opportunities and your self esteem. 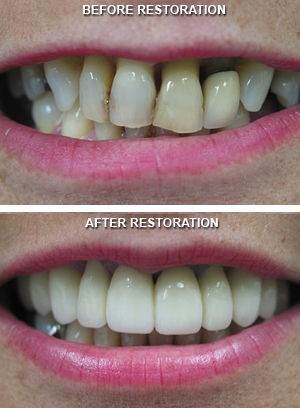 If your teeth are crooked, missing or discolored, a whole mouth restoration dentist is your best bet. Are you missing out on everything that comes with a big, beautiful smile? Dolphin Dental Can Help! Call us at: 727-393-9334 for a free consultation. Whether you like it or not, your smile either conveys that you are confident and approachable or quiet and reserved. Don’t let your smile cover up the dynamic person you are. Over the span of your life, you may have various dental procedures done. Filling, crowns and maybe even an implant or two have been done at separate times over the years. A whole mouth restoration dentist can give you full set of teeth that you have always envisioned. Lets face it, your smile didn’t get the way it is now over night. Oftentimes old sports injuries or maybe even a car accident may have caused damage to your gums and resulted in shifting of your teeth. In severe cases, we can completely reconstruct the entire mouth. After a thorough examination of your mouth, including teeth, gums and bones, we will discuss which dental reconstruction procedures will work best for you. Even in extreme cases where periodontal disease may have eroded otherwise healthy gums, we can still help. Large gaps in teeth can be filled with a dental implant or even a permanent bridge. With the technology we use today, crooked teeth can be straightened without using unsightly metal braces. Misshaped teeth can receive porcelain veneers that are nearly perfect in appearance. Chances are you’ve waited selflessly to have a full mouth restoration procedure done. Maybe you were raising a family or working hard to ensure your retirement. Whatever the reason, it’s finally time to make your smile and your confidence a priority. Call us to schedule a free consultation. Allow us to discuss and provide you with a whole mouth restoration plan that is customized just for you. We are conveniently located in Seminole, FL and look forward to providing you with attention and care that you deserve.